One of the major discoveries of the Italian Renaissance, this sculptural grouping was found in Rome in 1506 in the ruins of Titus’ palace. It depicts an event in Vergil’s Aeneid (Book 2). The Trojan priest Laoco�n was strangled by sea snakes, sent by the gods who favored the Greeks, while he was sacrificing at the altar of Neptune. Because Laoco�n had tried to warn the Trojan citizens of the danger of bringing in the wooden horse, he incurred the wrath of the gods. The grouping was probably designed for a frontal view only. The theatricality and emphasis on emotional intensity is typically Hellenistic Greek–often called Baroque as well. 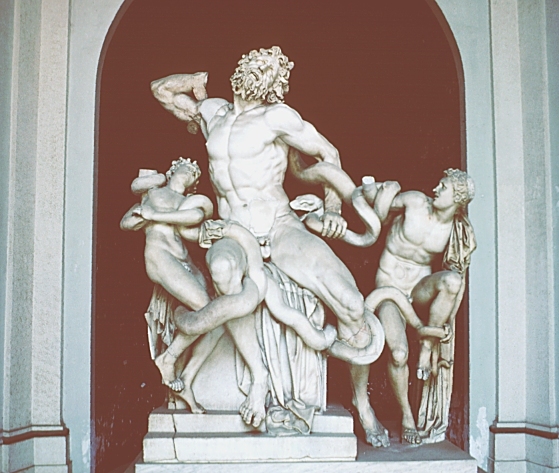 Note the writhing serpents, one of whom bites Laoco�n ‘s left leg, and pained expressions.